My 12-year-old snagged the cute bookcase designed to look like a dollhouse that I had sitting at the top of the stairs. She dragged it into her room so she'd have some shelves on which to store her books from The Dork Diaries series. A lover of fine literature she is not, but hey, at least she's reading. Right? RIGHT?! 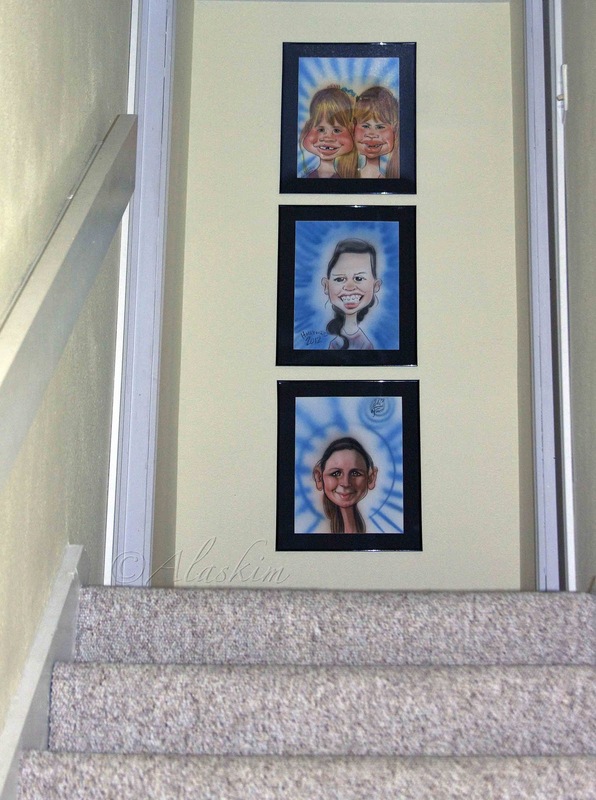 The landing looked so bare that I decided to hang some caricatures of the girls we had drawn at Universal Studios a few months ago. What's that? I never bothered to blog about our trip to Disneyland and Universal Studios? Well, that's about to change this week. Gird your loins, gentle readers, I've got lots of disturbing pictures of my children harassing the costumed characters. Poor Mrs. Incredible. I hope she didn't quit her job after my twin daughters refused to let go of her hands and followed her all over California Adventure Park. Imagine you're a guest in my home, stumbling up the stairs in the dark to return to your bed, when you look up and see those scary beautiful faces. Sweet dreams. Those are so fun. I have a friend who used to manage the charicature artists at Disneyland. They even let some of us model for them when they opened a new stand.